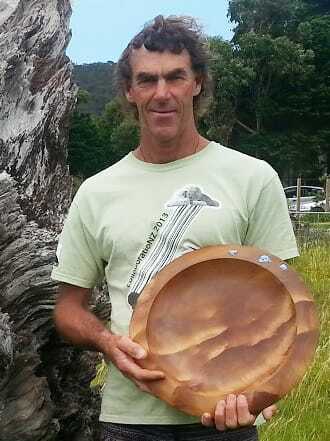 Based at Ocean Beach in the beautiful surroundings of Te Whara, Bream Head, I have been wood turning for about 20 years. Much of my inspiration is drawn from the area and the artistic community in which I live. I work mainly in salvaged Swamp Kauri, sourced by myself from several areas around Northland. I don’t cut any trees down! Much of this wood is comparatively recent (1000 – 4000 years old) and is close in colour and structure to new Kauri. I use mainly stump wood which gives some beautiful grain effects, designing each piece to best display these features. My work is mostly bowls and platters of various sizes ranging from 150mm to 400mm, with some natural edged and hollow formed work. I use inlays often of paua shell or bone to enhance natural flaws and features in the wood, and I also do some carving, texturing and colouring. I currently sell my work through several outlets in Northland and Auckland. I believe my pricing is very competitive and I am able to supply promptly. My wife and I run a small farm from which I also mill and supply kauri from a large stockpile. My other interests are surfing, yoga, music and reading. I also do volunteer work in conservation and ecology on our beautiful local reserve.